The third and final game created for the game design practicum course at UCSC over three weeks. Super WOW is a re-imagining of Atari’s original Missile Command arcade game with a special internet meme twist. As sole programmer on the team, I leveraged Unity3D’s new 2D development environment to implement all of the game’s mechanics and features. 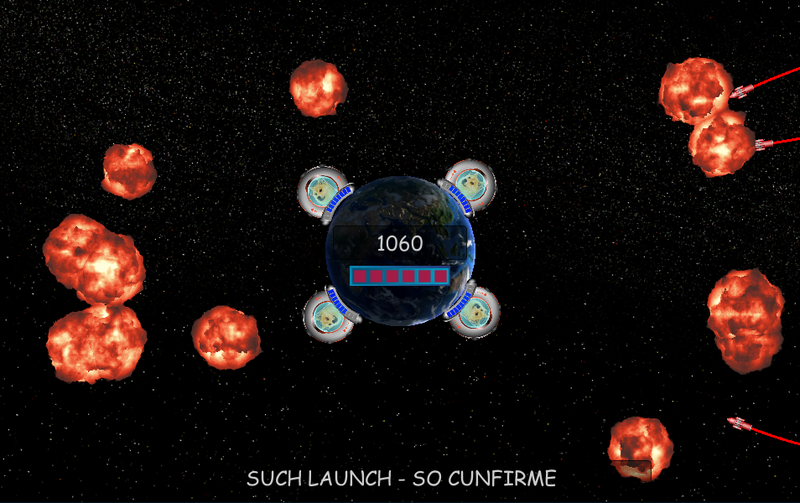 The primary change that was done while re-imagining Missile Command was the decision to make the game-play center around the entire earth while missiles approach from a circle towards the planet. As the only programmer on this project I was responsible for quickly putting together the game-play mechanics and fine tuning the missile pathing. A last minute design choice was made to change the working title from Missile Command to the meme inspired Super WOW: Such Defense. From there the game took on a life of its own becoming the most popular game created during that quarter of game design practicum both on campus and on-line. A third-person person 3D Arcade game created for UCSC’s game design practicum course in three weeks. I acted as lead developer on this project where everyone was new to Unity3D and 3D game development. The original concept was to have two players control a robot in a QWOP-inspired game. As we dived into Unity3D for the first time we quickly realized that we may have bit off more than we can chew. Completing the art and implementing it was what took the largest amount of our time leaving little to implement the co-op mode. In the end a task we thought impossible at the time, making a 3D game in three weeks with no prior knowledge, turned out to not be that bad at all and was an amazing learning experience going forward. This entry was posted in Games and tagged Kongregate, UCSC, Unity3D on 02/15/2014 by bgabin. Created as part of a two man team at UCSC, VOID is a 2D puzzle platformer. In VOID, the mechanic of gravity shifting is greatly enhanced by camera locking technique where the player can wrap around the screen to the other side whenever they choose. On this project I mostly focused on implementing the camera locking mechanic and the UI. Since the class this was created for required the use of Game Maker my partner and I decided to focus on game design and pushing Game Maker as far as we could, creating a game far above average for the massive freshman level game design course taught by Brenda Romero. We decided to only use GML to make the game instead of the built-in visual programming style which gave us a lot more flexibility. Due to a lack of art available to the game the decision was made to rely heavily on Game Maker Studio’s particle system to generate appealing and interactive programmer art. Once our foundation was built we were able to pump out a full tutorial and two demo stages showing off various sample puzzles and advanced game mechanics. In the end we ended up as semi-finalists in the class competition consisting of games from over a hundred students. Linked below is the final presentation executable of VOID created using Game Maker Studio. We are still extremely interested in pursuing this game idea to release and intend to start the game over in Unity3D and release on multiple platforms in the future. Switches add complexity to the game as shifting gravity may dislodge boxes currently holding switched. Tutorial with Khan the Mentor teaching controls. The interactive level selection menu. Black hole hazards allow for alternative movement. No-gravity-shifting zones allows the player to move only objects outside the zone. No-camera-locking zones prevent the player from zooming in and going around the pillar. This entry was posted in Games and tagged Game Maker, Games, UCSC, VOID on 02/15/2014 by bgabin. The core mechanics of R.E.M. combined the timing based platforming of BIT.TRIP.RUNNER and the rythym matching of games such as Guitar Hero. The player would have to match the color bars as they moved across the screen while simultaneously jumping over and sliding under obstacles. Much of my work revolved around the dynamic level generation which was going to use onset detection methods to gather information from user provided music files. Unfortunately, the level generation taught me an important lesson about project scope when I barely completed the onset detection near the end of the project and had no time to actually use the data to create levels. A non-intractable prototype for the onset detection is available below. Also unfortunately, the web server we were using to host the game does not properly serve the files required to run the game, but if anyone is interested they can contact me.